This film is available as part of Tartan's Michael Haneke Trilogy, which also includes The Seventh Continent and Benny's Video, which have been reviewed separately. If I were drawing up a list of favourite film titles, then Michael Haneke's 71 Fragments of a Chronology of Chance would definitely be on it. Guaranteed to instantly intrigue fans of alternative cinema, it's the sort of title that seems almost designed to send mainstream addicts scurrying. It's suggestively art-house, but in its way is as up-front a description of the film's content as Snakes on a Plane. 71 Fragments takes a true life incident – a student who walked into a bank and killed three people and then himself for no apparent reason – and follows the threads of chance that brought some of those involved to that location at that time. At the outset they are unconnected: a young asylum seeker crosses the border into Austria; a man wakes up and expresses concern for his baby daughter; one student challenges another to solve a shape puzzle; an old man cooks and eats food in his apartment; a couple arrive at a foster agency with a gift for the girl they hope will come to live with them; guns are stolen in a break-in at an army barracks. As with the director's first feature, The 7th Continent, we are only supplied snippets of information and are invited to fill in the gaps, the film comprised of sequences that vary greatly in length, running from a few seconds to several minutes. The fragmentary nature of dealing with several stories in such a way makes it hard to engage with any of them on a meaningful level. But then it seems likely that we're not meant to. More than either of Haneke's previous two features, 71 Fragments has the feel of a cinematic experiment, a detailed preliminary sketch for a fully formed work that would later appear as Code Unknown [Code inconnu: Récit incomplet de divers voyages] (2000), but a consistently interesting and complex sketch nonetheless. As with his two previous films, a lot is suggested but little is shown and the threads unwind in largely economic fashion. This is most evident in the story of the young asylum seeker, whose entire journey from initial border crossing to new family is told as a series of short sequences establishing only his present status quo, the decisions and actions that brought him to that point remaining largely unseen. The route to the final scene in the bank, foretold by an opening title card and the storyline that puts a gun in the hands of a volatile student, is used by Haneke to observe certain aspects of human behaviour, whether it be loneliness, selfishness, or even obsessive drive. The last of these is very effectively realised in a static, three minute shot of a table tennis player giving his all against a ball serving machine. It tells you a lot about determination and commitment to his sport, but little about the person beneath, unless you accept the notion that a person is what he does, which I do not. It has been suggested elsewhere that Haneke's purpose is to examine lives that are somehow empty and pointless, but to do so based only on a number of small observations of limited activity would be superficial at best and would assume an arrogance on the director's part that I would hesitate to accuse him of. Certainly the point Haneke is making here is more opaque than usual, and for my money less fully realised, especially compared to the similarly structured Code Unknown, where characters are more richly defined and the individual stories have clear purpose and more depth. Both films are intrigued by the notion and consequences of chance, but 71 Fragments lacks Code Unknown's almost epic sense of cause and effect, where litter thoughtlessly discarded by one character ultimately leads to the deportation of another. As with the director's previous two films, news broadcasts make a regular appearance and consist largely of trivia or stories of war or conflict. This appears to have more to do with Haneke's belief that for many reality is experienced only through the media than the various story threads the material is intercut with, although later a TV article becomes the catalyst for the combination of two seemingly disparate stories, three if you see the news reports as one of them. 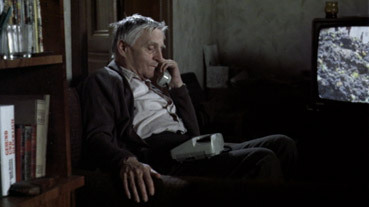 Haneke suggests that our failure to really communicate with each other is central to the film and this is sometimes very effectively realised – a cashier is distracted by the sight of a security guard who crosses himself while on the phone and is a little brusque with an elderly customer who turns out to be her father, momentarily linking two of the threads via a third party (the father later bends his daughter's ear in a phone call that lasts nine screen minutes, a shot that you can't help suspecting Haneke used to test how long he could hold on a single, static shot without losing the audience). But fragments they remain, little moments from small narratives that may or may not be destined to end when the characters arrive at the wrong place at the wrong time. It's still an intermittently fascinating film, but lacks the cohesiveness and clear sense of purpose that made 7th Continent and Benny's Video so riveting and unsettling. As with the previous two films in this set, the 1.78:1 anamorphic transfer here has good contrast and colour and a decent level of detail, though is just shy of what I'd describe as sharp. Only in a couple of low contrast darker scenes do any real problems appear in the shape of rampant grain and the associated compression artefacts. The Dolby mono 2.0 track is clean and with a very reasonable dynamic range. Haneke rarely uses non-diegetic music, but dialogue and sound effects are well reproduced. The expected Michael Haneke Interview (23:30) is the longest of the three on this set but the one that is least focussed on the film in question, with the director discussing the process of screenwriting and his love for the editing process, and his strong dislike for films that "turn evil and violence into consumable commodities." As ever, it is both informative and engaging. Most Michael Haneke films divide opinion, but where the others prompt argument over their content, here it's the effectiveness or otherwise of the technique that becomes the focus, some hailing a plethora of layered detail and others suggesting that there is actually less here than meets the eye. I find myself sitting somewhere between the two, admiring the technique, the small detail and the economy of some of the storytelling, but still left a slight sense of incompletion.